Blockbuster Release: Toronto Island Flood 2017..
"For many Torontonians in general, 2017 could be called “the year of the flood.” Higher amounts of rainfall during the spring caused Lake Ontario to swell by 55 centimetres, submerging not only parts of the Toronto Islands, but also affecting regional shorelines..."
"The cause of these kinds of flooding isn’t a secret. 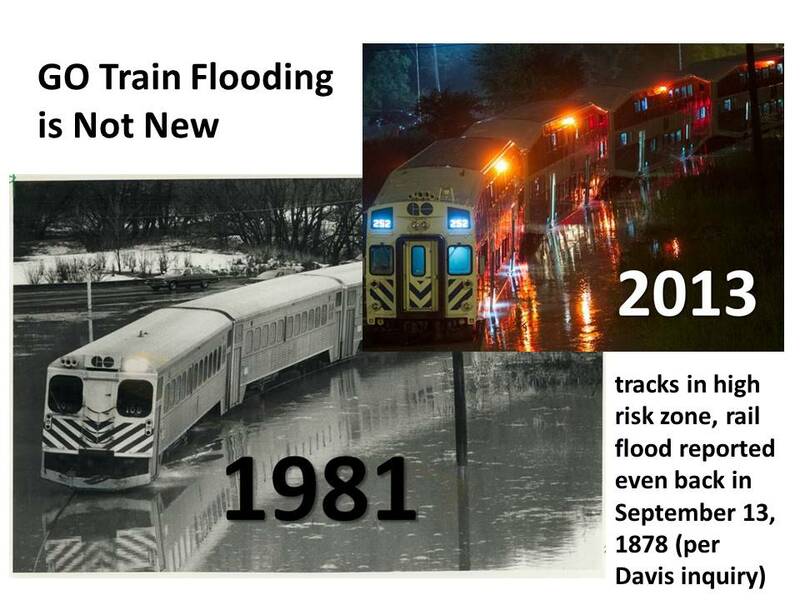 Climate change is having major local impacts across the Greater Toronto and Hamilton Area (GHTA) including major flooding. Storms and extreme weather that typically happened every 20, 40, 80, to 100 years are now happening with increasing frequency." Correction: August 2017 did not set a record - that is held by 1947 levels. April record remains 1973. May 2017 Lake Ontario levels were a few centimetres above historical maximum values in 1973 - June levels in 2017 (not shown) were similarly only a few centimetres above previous maximum monthly average values. 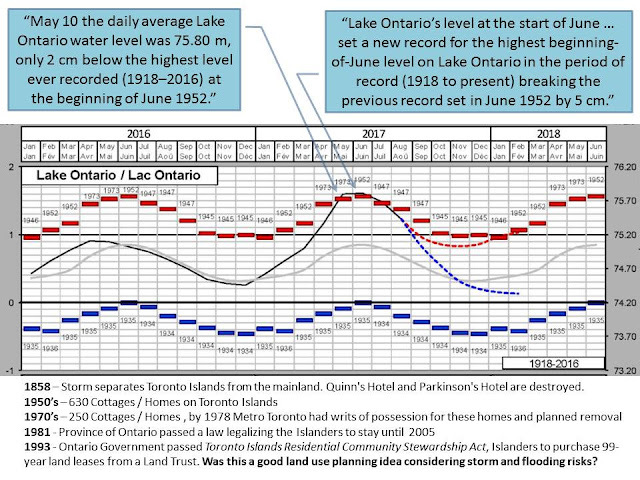 By August 2017 Lake Ontario levels were no greater than previous maximum values in 1947. So 2017 Lake Ontario levels are not a blockbuster climate change impact but rather a slow prodding sequel to previous fluctuations in levels. 1858 – Storm separates Toronto Islands from the mainland. Quinn's Hotel and Parkinson's Hotel are destroyed. Was granting 99-year leases a good land use planning idea considering storm and flooding risks? Or did it unnecessarily add flood risk to a known high risk area, that had high lake levels in the past and significant storm damages even back in the mid 1800's? Obviously history shows us that there is not a significant climate change impact affecting flood risk but rather deliberate land use planning increasing the investment in a vulnerable area, as opposed to removing the risk (as was the plan through the 1970s). The Toronto Island flooding is not unlike the Gatineau flooding in 2017. Buildings have been historically been built in areas that are at a high risk of flooding, and given enough time the risk will manifest themselves. Over time, old records will be broken - that is fundamental of statistical observations of random events, and not necessarily climate change impacts pushing old records higher. And the Toronto Island risks are not unlike high profile locations like High River, Alberta in 2013 or low profile locations like Cedar Beach Road, Clarington, Ontario in 2017. All these locations have intrinsic flood vulnerabilities based on their location and land use planning decisions. It is easy to call this a climate change impact but it it not accurate as the risks are long-standing ... yes back to the 1800's there were storm risks too. Historical Lake Ontario water elevations and 2017 records. 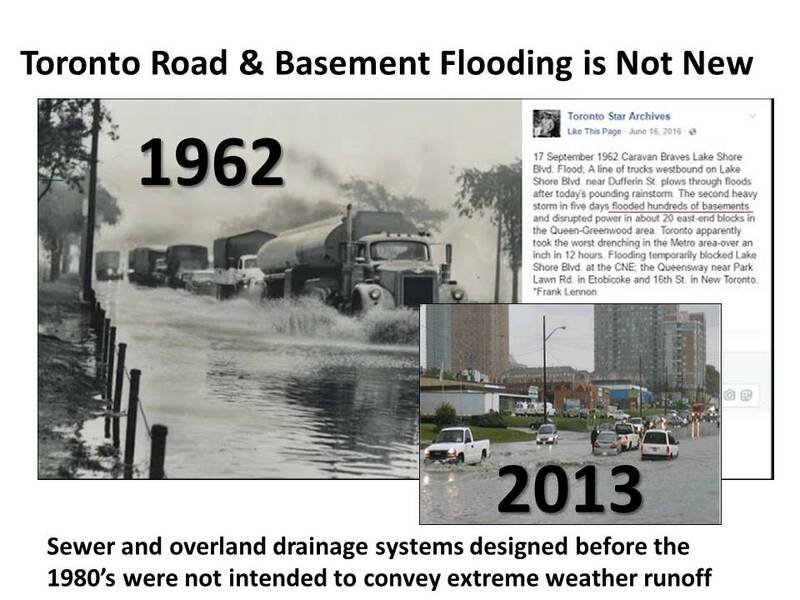 3) Toronto Island flooding and high Lake Ontario levels - not new either. 2017 levels nudged above previous records for May 1973, June 1952 and July 1947. It is not reasonable to expect that after 70 years very old records may be surpassed, like the July 1947 record being surpassed in 2017? Or that newer records would be surpassed too, like May 1973 after 44 years? After all its only a 100 year period of data and the Cornwall and Long Sault dams have been in place for just over half that time. Wang's Ph.D. thesis at the University of Guelph describes changes in frequent and extreme rainfall trends. The thesis is available here. Confidence limits on 2-year, 5-year, 10-year and 25-year rainfall intensities for durations of 5 minutes to 2 hours show no significant changes in most cases and decreasing rainfall intensities at many stations. · The arrows and hyphens in cells represent the results of CI comparison of 2, 5, 10, and 25-year events (from left to right). An up-arrow ↑ indicates an increase of rainfall intensity occurred in the 2nd period of record, and a down-arrow ↓ indicates a decrease of rainfall intensity. A hyphen means no significant change (α = 0.1) is shown or, in other words, the CIs are not significantly different. Cells with slashes represent records that are not stationary. 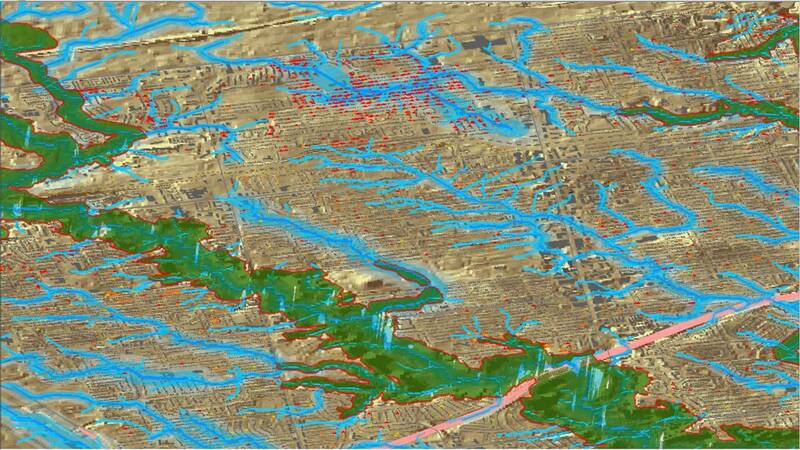 An assessment of major flood trends was conducted by a group of researchers including Environment and Climate Change Canada and University of Waterloo Civil and Environmental Engineering. They found no evidence that climate change has to date increased the occurrence of floods. Concern over the potential impact of anthropogenic climate change on flooding has led to a proliferation of studies examining past flood trends. Many studies have analysed annual-maximum flow trends but few have quantified changes in major (25–100 year return period) floods, i.e. those that have the greatest societal impacts. Existing major-flood studies used a limited number of very large catchments affected to varying degrees by alterations such as reservoirs and urbanisation. In the current study, trends in major-flood occurrence from 1961 to 2010 and from 1931 to 2010 were assessed using a very large dataset (>1200 gauges) of diverse catchments from North America and Europe; only minimally altered catchments were used, to focus on climate-driven changes rather than changes due to catchment alterations. Trend testing of major floods was based on counting the number of exceedances of a given flood threshold within a group of gauges. Evidence for significant trends varied between groups of gauges that were defined by catchment size, location, climate, flood threshold and period of record, indicating that generalizations about flood trends across large domains or a diversity of catchment types are ungrounded. Overall, the number of significant trends in major-flood occurrence across North America and Europe was approximately the number expected due to chance alone. Changes over time in the occurrence of major floods were dominated by multidecadal variability rather than by long-term trends. There were more than three times as many significant relationships between major-flood occurrence and the Atlantic Multidecadal Oscillation than significant long-term trends." The paper is available from the Journal of Hydrology. The authors are from across the world. Since rainfall intensities are not increasing dramatically across Canada, as demonstrated by Environment and Climate Change Canada (ECCC) in the Atmosphere-Ocean in 2014, saying rainfall intensities are stationary, it makes sense that major floods are not increasing either. Of course there may be local regional trends - ECCC found that there are decreasing rainfall intensities in regions such as the St Lawrence basin of southern Quebec and the Maritimes. Their Engineering Climate Datasets (version 2.3) also show twice as many statistically significant decreasing trends as increasing ones in southern Ontario. The paper Climate-driven variability in the occurrence of major floods across North America and Europe focused on minimally altered catchments in order to isolate climatic as opposed to hydrologic drivers. It focused on large watersheds. As noted on this blog, urbanization is a key driver of flood risk in small urban catchments and is expected to have increased of the past 50-100 years in many Ontario cities. 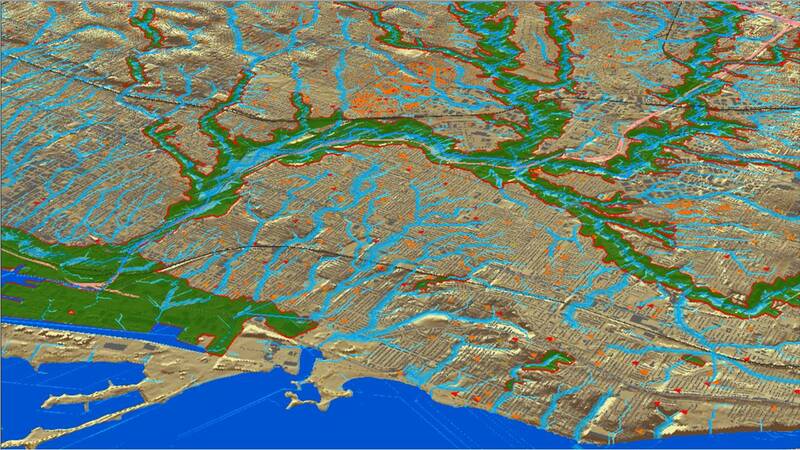 This is link to GIS mapping of changes: Ontario city urbanization affecting runoff and flood risk since from 1966 to 2000. If Hurricane Harvey hits Toronto will it be "The Day After Tomorrow" Stormageddon, Rainpocalypse? Sensational pseudo-science in media should be viewed with caution. The comment below is awaiting moderation on The Weather Network. It is in response to the article "Visualizing what Harvey's impacts would look like in Canada". A few 2D maps on hot spots and 3D renderings are attached. The Weather Network promotes Science Behind the Weather all the time but does not get into much depth on hydrology and hydraulics and other scientific disciplines that come into play between weather and flooding. 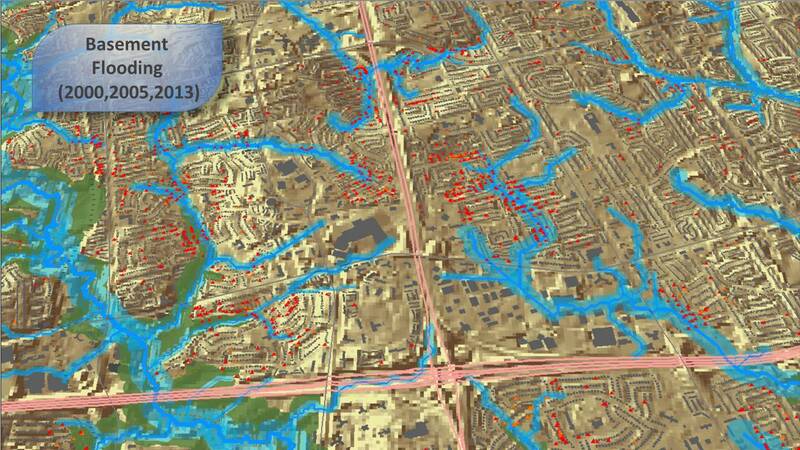 Just checking the "math" on Toronto Hurricane Harvey flooding simulation. I give it an "A" in grade 9 Algebra - yes, 56.8 cubic kilometres of water will have a height of 90 metres over Toronto's 630 square kilometers - kudos for being able to divide a volume by an area to get a depth - that would just about immerse the 130 metre tall Royal York Hotel as shown. But a D minus in Geography - grade 9 kids learn about the water cycle and that rain runoff water flows off land - it does not stack up like jello unsupported from its sides like the Hurricane Harvey Toronto flood math suggests. A F in physics because runoff water is viscous and flows instead of ponding up vertically. E minus in hydrology for anyone with an engineering college technologist certificate - again, water accumulates over and runs off through watersheds not defined by municipal boundaries - the rainfall volume should actually be bigger than 56.8 cu.km because the Toronto watersheds extend beyond the political boundaries. D minus for hydraulics as when it rains runoff flows away based on the hydraulics and at times the storage routing of the urban drainage and river and lake systems. This means runoff does not stack vertically, some infiltrates into the ground for small storms, and most flows away during the storm with the flood depth determined by the hydraulics at the time of peak outflow. All 2nd year civil engineers know from basic hydrology courses that axiom. But in the Hurricane Harvey simulation it is not even a remote consideration, nor is basic watershed science and hydrologic cycle considerations. I really do encourage The Weather Network to focus on the science behind flooding and it requires a more broad perspective on scientific disciplines beyond meteorology. Some scientists criticized the film's scientific aspects. Paleoclimatologist and professor of earth and planetary science at Harvard University Daniel P. Schrag said, "On the one hand, I'm glad that there's a big-budget movie about something as critical as climate change. On the other, I'm concerned that people will see these over-the-top effects and think the whole thing is a joke ... We are indeed experimenting with the Earth in a way that hasn't been done for millions of years. But you're not going to see another ice age – at least not like that." J. Marshall Shepherd, a research meteorologist at the NASA Goddard Space Flight Center, expressed a similar sentiment: "I'm heartened that there's a movie addressing real climate issues. But as for the science of the movie, I'd give it a D minus or an F. And I'd be concerned if the movie was made to advance a political agenda." 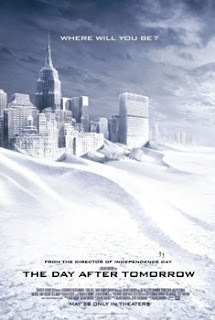 According to University of Victoria climatologist Andrew Weaver, "It's The Towering Inferno of climate science movies, but I'm not losing any sleep over a new ice age, because it's impossible." Patrick J. Michaels, a former research professor of environmental science at the University of Virginia who rejects the scientific consensus on global warming, called the film "propaganda" in a USA Today editorial: "As a scientist, I bristle when lies dressed up as 'science' are used to influence political discourse. "College instructor and retired NASA Office of Inspector General senior special agent Joseph Gutheinz called The Day After Tomorrow "a cheap thrill ride, which many weak-minded people will jump on and stay on for the rest of their lives" in a Space Daily editorial.